Sometimes Google's results aren't that useful and they don't answer your question. Maybe the query is imprecise or obscure, the results are outdated or you don't have the patience to check the first 100 results to find something helpful. Asking your Twitter followers or your Facebook friends could be a great idea. Google doesn't integrate with Twitter or Facebook, but it experiments with a new feature that shows a message below the list of results: "Want to ask your friends about [your query]? Ask on Google+". 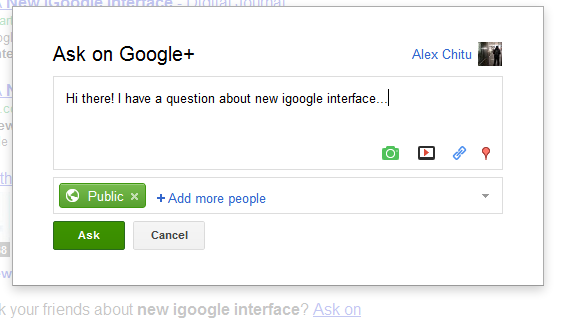 Clicking the link opens a Google+ box that already includes a message: "Hi there! I have a question about [my query]..." Edit your message, click "Ask" and the first results could show up in a few seconds in Google's notification widget. Maybe Google+ also will include a revamped version of Aardvark and you'll be able to send your question to the right people. OK. I would use this. Quora is useful and fun, but I would prefer these answers to be in the SPYW results. Alex. You're going to be busy this year if they are releasing a feature a day and retiring so many services. Also, why did Google buy Aardvark when it would have stop working on it anyway? OMG I re-found that blog after 3 years, wow! Anonymous, I do not think they will be retiring to many more services, from I can Orkut is probably the last one they have not yet announce when they are going to close it down. The engineers working on Google+ must be so proud to have built a product that is doing sooooooooo well through organic growth and based on the product's merits rather than by relentless promotion in the SERPs and forcing people to use it. Congratulations, go team! Oh, the schadenfreude and sarcasm. For what it's worth, I prefer Google+ (the social network) to Twitter, FB, Bebo, Orkut, Quora, Hi5, Friendster, etc... And, quite frankly, it is impossible for a product launched by a large internet company at this point without it having an advantage over smaller start-ups. I genuinely feel sorry for the engineers who work on this, they're building some cool features* but have no real way to measure how successful any of them are. Google+ has some cool features, but it lacks actual desired adoption - sure it has loads of people signing up, but that's because Google is either begging (huge blue arrow on homepage) or forcing (you now have to be on G+ to have a Gmail account) people into using it. Sure a few people are using it, but not as their primary social network - Facebook and twitter still win there and will carry on doing so. Google missed the boat here, and should be working to integrate not trying desperately to catch market share at the expense of the quality, relevance and trustworthiness of their results. Best thing Google could have done for social search? Got back around the table with Twitter - what people are saying *right now* about a subject 100x more useful than any content on Google+ right now, guaranteed. * less sure about the meme generator, but hey it's working for Cheeseburger Network so they'll copy it, then age them out of search results. Google+ is for a lot of things already ahead of Twitter. It's bigger, faster and has better search ;). RE: I genuinely feel sorry for the engineers who work on this, they're building some cool features* but have no real way to measure how successful any of them are. This is an excellent point, and I agree with you very much here. We're unable to determine whether or not that is true, given your previous excellent point. RE: Facebook and twitter still win there and will carry on doing so. I would have agreed with you until Search Plus Your World. If the doubling rate of sign-ups is 3 months the number of signed-up users will be astronomical by year's end. Sign-ups may not appear meaningful in terms of adoption, and they certainly aren't at first. However, given a critical mass people discovery is very much improved. And people discovery is a critical component of a communication network and can lead to important network effect (there are some fascinating examples of this from mail delivery companies in the middle ages in Europe). I do, as do most people (but indeed not all) who I have asked. But that is only my small part of the world. It would be very interesting to know what the general opinion is of this in a few months. Their tactic of making it opt-out is remarkable, but I think it also exposes a belief that Internet users must be trained and not told. RE: Twitter - what people are saying *right now* about a subject 100x more useful than any content on Google+ right now, guaranteed. Also, the social signals do not need to be numerous; a sparse signal is sufficient if it has low latency and high confidence (the frequency of signal is not the only source of confidence). If you have any more information that contrasts the latency of social signals, I would love to know. Essentially, I would like to know the time between the significant world event and it emerging on the major communication networks. It is very hard to get a hold of this information from most of the networks. However, again, I think your point about the engineers not have sufficient feedback about the value of the various features is excellent. They will need to make very difficult decisions, I imagine, because of that. I think there would be no that much advantage with Google+ to search for our requirements when compared to Google search results.